It's probably the most homogeneous borough in London. An unrelenting expanse of housing, mostly inter-war overspill, all pebbledash, plaster and brick. The avenues criss-cross for miles, interspersed with parkland, all the way down to an industrial band along the Thames. You'd be hard pushed to find a rich bit, to be honest. The borough's population is becoming increasingly diverse, as the original East End escapees are joined by migrants from elsewhere. Residents toyed with the BNP for a few years, then thought again, and the council's once again solely a Labour preserve. And in an unfortunate coincidence, the borough's initials spell out the word BAD. It's Barking and Dagenham, and rest assured, the acronym's not true. Most of Barking and Dagenham is relentlessly 20th century. So it comes as something of a surprise, bang in the middle of a housing estate in Upney, to find a proper Tudor house still somehow standing. It's a National Trust property no less, one of only a dozen in the capital, and I'd bet one of the least known. And it's not often open, only Mondays, Tuesdays and the first and second Saturdays of the month, which means I had to sneak along earlier this month to take a look around. I'm glad I did. It's a gem of a property, set in an acre and a bit of green, rising tall above the streets of regular semis all around. 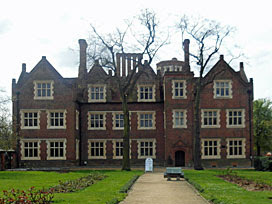 The house was built by London merchant Clement Sysley during the reign of Elizabeth I, at what was then a suitably remote distance from the City. Its brickwork is almost all original, all handmade on site, including certain longer-baked dark bricks than glint in the sunlight [photo]. Look particularly carefully... and you may need guidance for this... and you should see hearts and diamonds picked out in pixellated brick. And for that guidance, step inside. When the nice ladies on the counter ask whether you'd like to walk round by yourself or take a guide, choose the latter. A solo wander will reveal a municipal building with pretty walls - somewhere nice to have a wedding or hold a meeting. What you really need is a National Trust volunteer to bring the place to life. Maurice dresses up in full costume on the first Saturday of the month and takes the role of the steward of the house, starting with a trip out onto the front lawn to point out the playing card symbols. There's a rather charming walled garden round the side, which would have been hedged and knotted back in the day but is now four squares of turf [photo]. Further round is a walled courtyard liberally sprinkled with cherry blossom, from which there's a fine view upwards to the dozen or so twisted Tudor chimneys [photo]. By now on the tour Maurice will have pointed out the bee boles (tiny alcoves for buzzy creatures) and explained about the primitive toilets and revelled in explaining the derivation of the phrase "taking the piss" (yes, sorry, that). Back inside are the rooms where wedding receptions happen, be those Clement's Tudor daughter or modern Elizabethan locals. A gorgeous modern tapestry recreates the former, as a backdrop to nuptials booked on the third, fourth and occasionally fifth Saturdays of the month. There's a finer hall upstairs, still with patches of fresco depicting Romanesque seascapes and sylvan Merrie England. Also here are the bedrooms where the Sysleys once lived, later converted to a hayloft, now unrecognisable as an airy long gallery. You'll like the western staircase, unless your head for heights is weak. This spiral's the original, in gravity-defying oak, corkscrewing up and up to a tiny garret room in the turret. The eastern alas no, that was ripped out by a former tenant who didn't have an eye on Eastbury as a future heritage attraction, and the replacement metal stairs are merely functional. 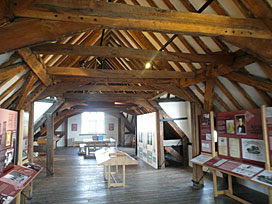 The top floor is the attic space, beautifully preserved with roof timbers carbon dated to 1566 precisely. Maurice is particularly keen on the roof, especially its expertly practical series of joists, which are the key to why the walls of the building have held up quite so straight over the centuries. Two long rooms contain displays explaining the history of the area, which is more interesting than you might guess, including the claim that the Gunpowder Plot was concocted in this very building. That may be true or may be fantasy, but there's a vague family connection, and Guy Fawkes might well have hired a boat here over the Thames from Kent. It's hard to believe today, looking out of the window down bog-standard Mayesbrook Road, where a tithe barn once existed until all the farmland was sold off for housing. The house lives in awkward proximity to some of its neighbours, with certain elements on the estate not averse to chucking bricks through its leaded windows. That's still evident in the Steward's room, whose panelled walls are painted a disconcerting shade of brown. The National Trust markets the colour to conservationists as "Eastbury Brown", although it could easily have been branded "Cheap Chocolate" or "Dung". And yes, of course there's a tea room serving refreshments. Its tables overspill into the aforementioned Steward's room, and also out onto a substantial proportion of the outdoor terrace. And yet the only people I saw using the tea room during my visit were the volunteers, resting over a drink and sandwich inbetween directing not many people around the building. This is, alas, a greatly overlooked National Trust property, and at only £3 a time (including an hour-plus tour) it really doesn't deserves to be. Unless you're free on Mondays or Tuesdays you'll now have to wait until the first Saturday of next month to visit, but that's going to be an extra-special WWII Day which'll be a bonus. Maurice says he'd love to see you there. The largest housing estate in Europe, the Becontree Estate, fills the majority of the borough of Barking and Dagenham. And it was the aftermath of the First World War that caused it to be built. Conscription had revealed to politicians how unfit and unhealthy the working classes were, so an effort was made to rehouse London's ex-soldiers and give them somewhere to thrive. 27,000 "Homes for Heroes" were built, which might not sound many, but was sufficient to boost the population of the area by a hundred thousand. New streets covered the former fields, broader than the slum terraces left behind, allowing an almost undreamed of feeling of space. Indoor toilets and back gardens were a novelty for most, even if plumbing and heating proved somewhat unreliable. These days you'd expect blandly repetitive design, and mostly flats, but Becontree boasted 91 different types of two-storey house. All the building materials were brought in by rail, along special tracks, and Valence Avenue is still twice as wide as normal because the planned transformation to a tram route never materialised. The first houses were built in Chittys Lane, just south of Chadwell Heath, and was completed in November 1921. They're still there today, in this very ordinary street with a mixture of underwhelming brick dwellings on both sides [photo]. Number 26 is marked by a blue plaque above the alleyway - a rather larger plaque than famous people get. I saw a twitch at the window as I stopped to take a photo, as if they're not quite used to passers-by being quite so interested in their historic property. The smell of curry was in the air - the only time during my entire day out that this particular odour reached my nostrils. And I'm sure that the man in a suit following me up the street was an estate agent, because nobody else around here ever dresses like that. Two hundred thousand'll buy you a home here today, a far cry from the hundreds they originally cost.